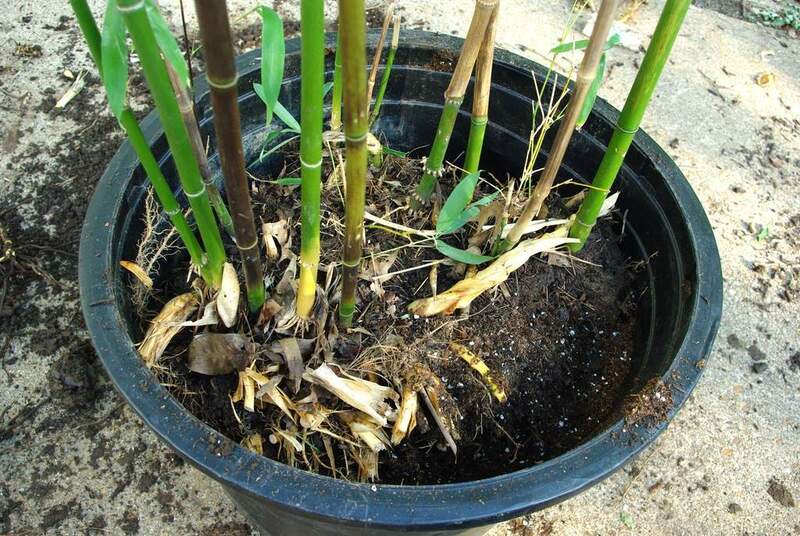 Yesterday I posted about taking several small divisions of bamboo and potting them up. 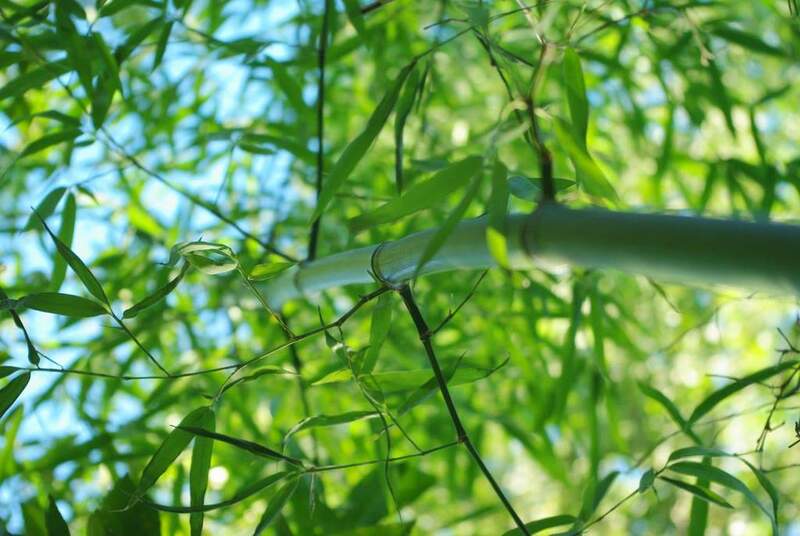 Today it's one division of bamboo only, but it's a large one. It's about the biggest that I can handle myself, and it came from my friend Michael's garden. 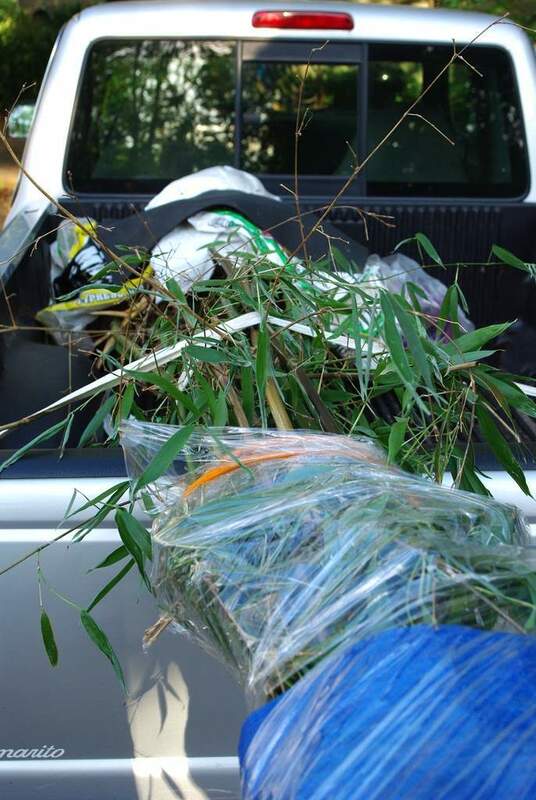 He's decided to reduce the number of bamboo species he has, giving more space to those that are doing the best and are most rewarding for him. That means more free plants for me, in exchange for helping him do a bunch of tough digging. 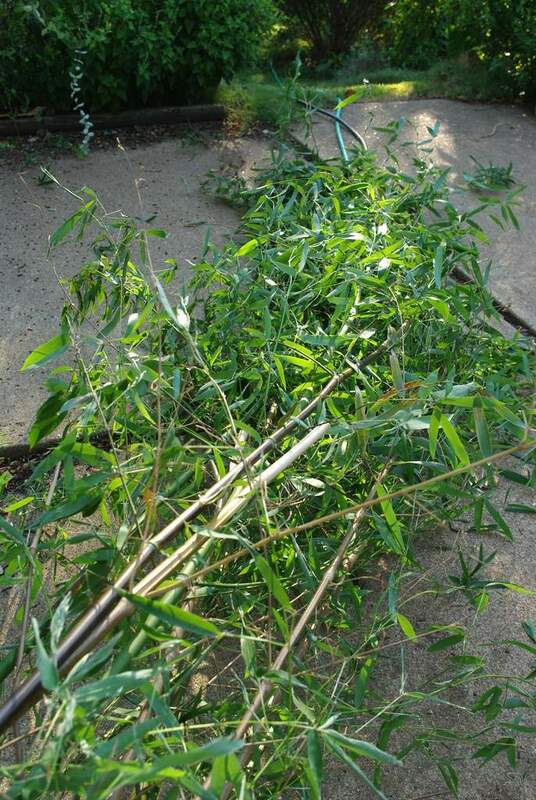 When looking at my yard and seeing all of the large pots of bamboo, you might think that I have enough bamboo, and wouldn't be interested in more plants. In fact I was thinking that same thing, and actually told Mike that I wasn't interested in a division of his Phyllostachys rubromarginata. But then I thought it over and realized that "rubro" is one of the more cold-hardy species, and I should probably accept his offer. A couple of hours later I was at his place doing some heavy digging, chopping, and prying. The division I ended up with is quite large, and it took both of us to drag it to the driveway and load it onto the truck. This was quite a tall plant, even though it was struggling a bit with too much shade. 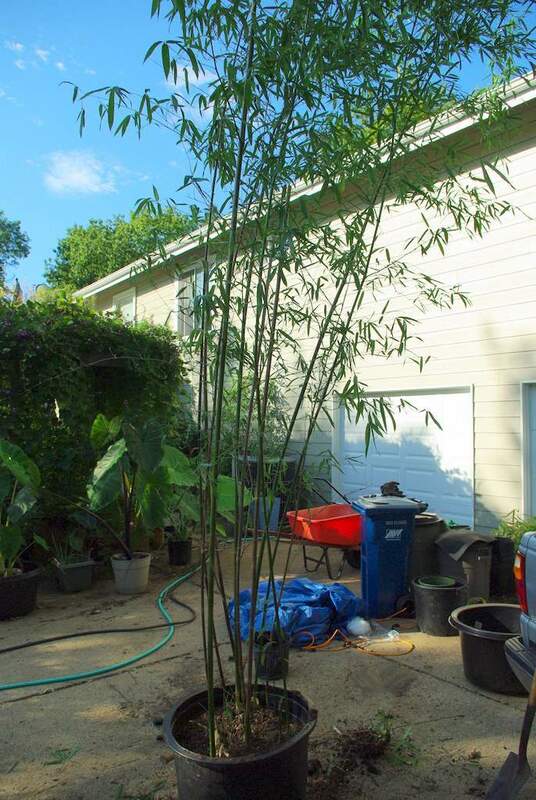 I think it was about 15' tall, even after I chopped off 4' or so from all of the tallest culms to help reduce the leaf area and avoid problems with leaf desiccation. I wrapped it to protect it from the drying winds on the ride home. The thing I always forget is that I need to unload it myself when I get home, and somehow get it into a pot. 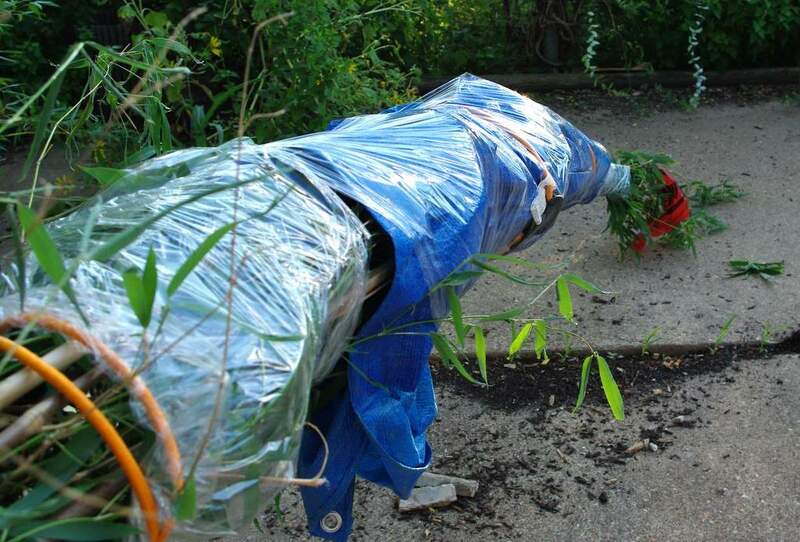 I certainly didn't want to tackle it in the evening, so I left the plant wrapped and in the truck overnight. It was easier than I thought it would be (thank you gravity!). The problem was I couldn't lift it up to put it into the pot (curse you gravity!). I tried a few times, but it just wasn't going to work, so I went to plan B: lay the plant back down and work it into the pot that way. 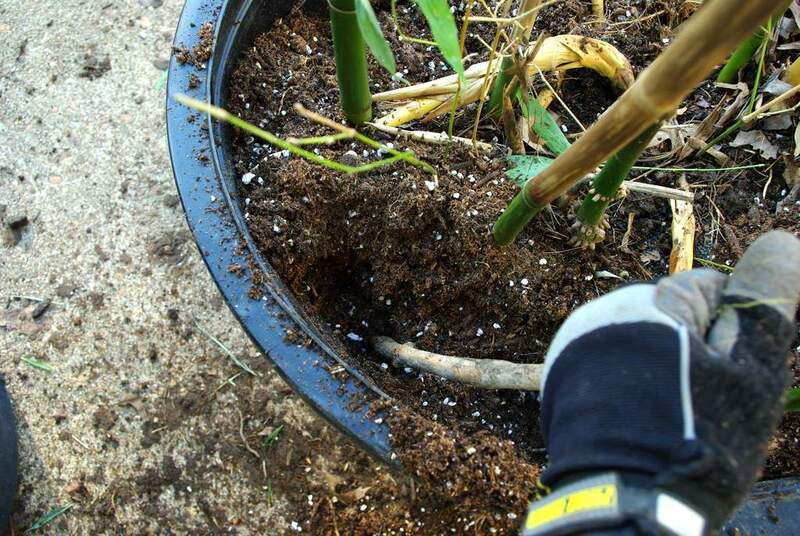 After removing that extra soil and roots from the one side I was able to lift the plant and get it into the pot! I'm not sure if I really made it that much lighter or if I just grabbed it in a way that gave me more leverage, but I'm glad I could lift it. Once it's in the pot it's just a matter of adding potting mix, making sure it gets underneath and around everywhere, leaving no air pockets. I was using a stick to help with that, as well as my fingers. 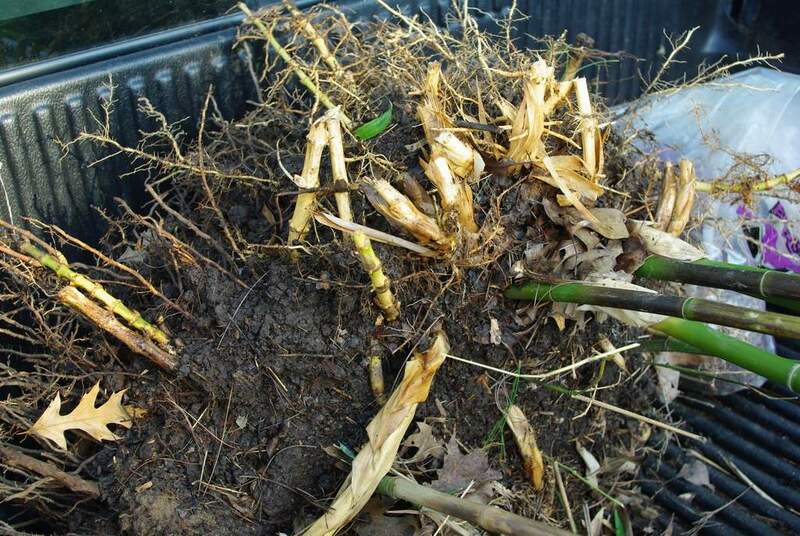 It's also important to check that the plant is as upright as possible before packing all of the soil in. 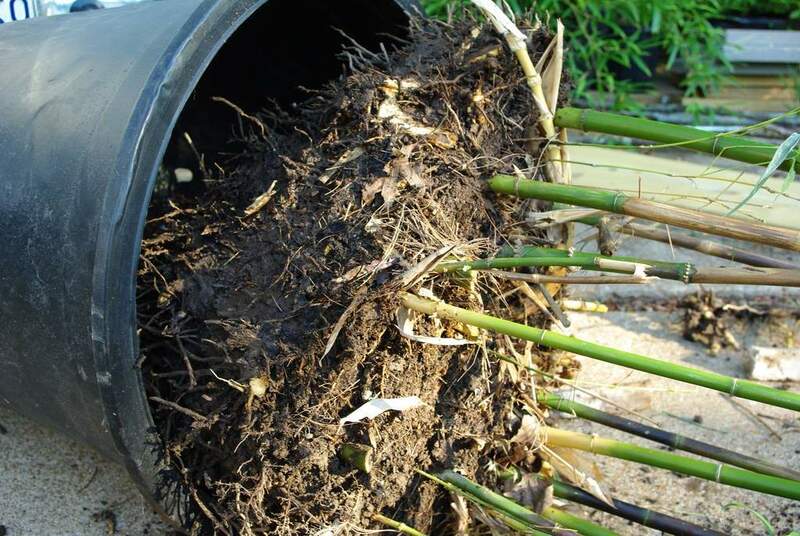 This one was a little tough to get upright as all of the culms were bent since they were really reaching for the light where they were growing. I did my best though. It shouldn't be too much of a problem though, as it seems to close up fairly well now that the pot is filled. It will probably leak there when I water, so I may want to tape over that or something in the future. I won't do anything until I see that it's a problem though. 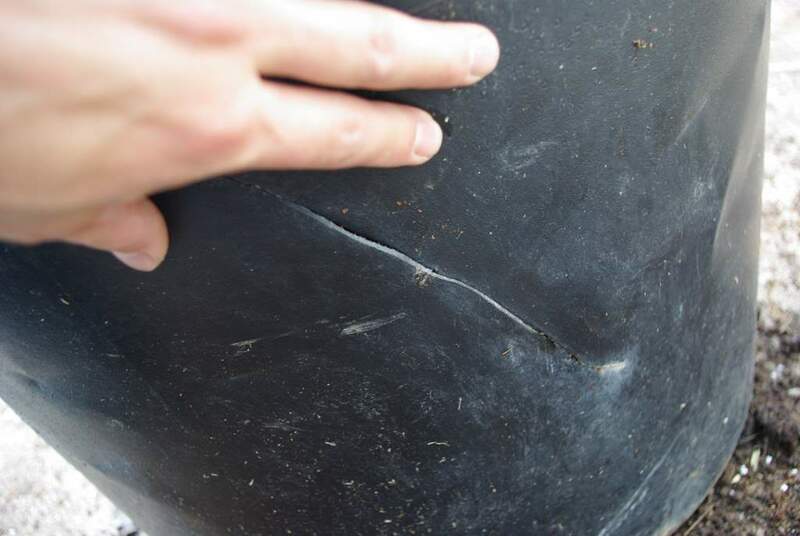 Luckily it doesn't make the pot any weaker -- this is a nice, sturdy nursery pot (25 gallon if anybody is wondering). 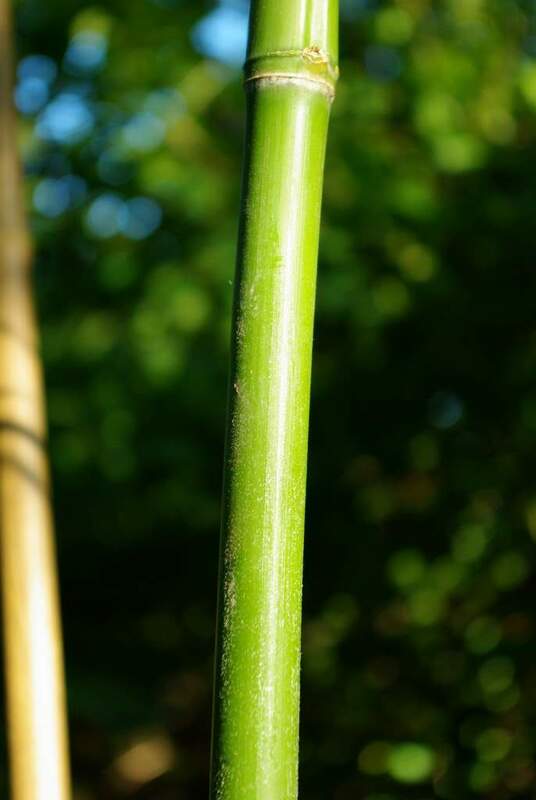 I also noticed that the culms have fine hairs on them, sort of like peach fuzz. I couldn't really capture that in the photo, but you can see a hint of it on the left side of the green culm toward the bottom of the photo. Now that I see it out in the open, it's a really nice plant! It should do much better for me than it did for Michael since I'll be able to plant it where it will get a lot more of the sunlight it needs to thrive. Now I just need to figure out where it's going to be planted... I have until next year though, so I've all winter to plan. That's the advantage of potting it up instead of putting it into the ground right away. I can also place the pot in the shade for a few days, then move it to a spot that gets more sun, then finally the full sun it wants. 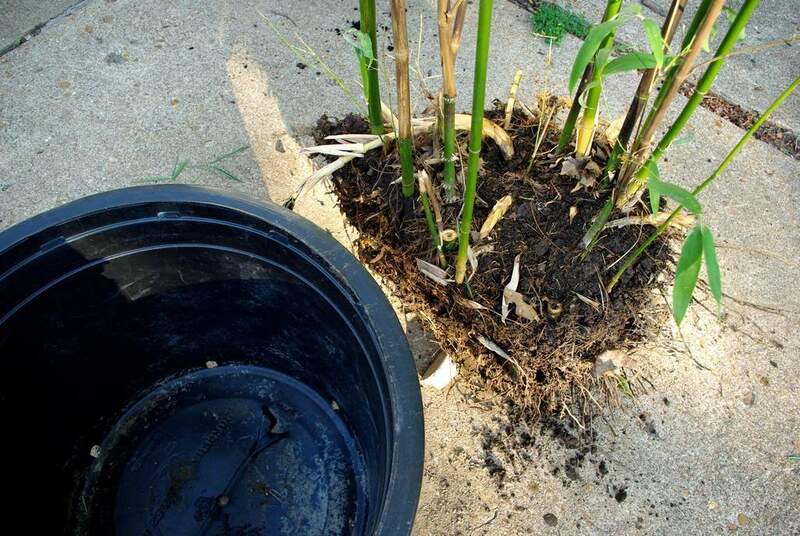 Plus I can put pots in different locations to see how bamboo might look permanently planted there. 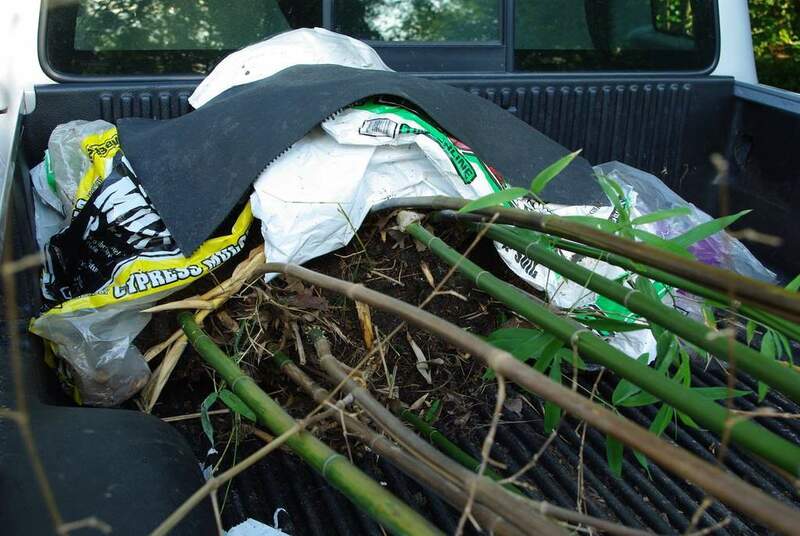 Not that it's easy moving 25 gallon pots of bamboo around, but it's easier than 35 gallon or larger pots, and certainly easier than digging plants up and moving them.